The protein Nanog, a transcription factor, is key to maintaining stem cells in a pluripotent state. Researchers from the Centre for Genomic Regulation have been investigating the role of this protein, and have just published an article in the prestigious journal Cell Reports where they reveal the mechanism whereby Nanog acts. The scientists have discovered that Nanog involves other agents and they have been able to detail their dynamics. In particular, by studying another protein that is also involved in cell reprogramming (beta-catenin) they have been able to improve the knowledge of Nanog's functioning. Cell renewal is a natural process that takes place constantly in our body. For this to happen, we have stem cells that are responsible for generating new cells to replenish and renew those that die. Stem cells give rise to undifferentiated pluripotent cells which have the ability to become any cell type. These pluripotent cells follow a differentiation path towards specialisation, which can produce any cell type from neurones to skin. The scientists want to understand the mechanisms that allow stem cells to either differentiate or remain pluripotent. There are also many studies that seek to reverse this process, to enable already differentiated cells to be reprogrammed and become pluripotent. Knowing all the players in these processes is of vital importance for understanding how stem cells work and allowing progress in regenerative medicine. 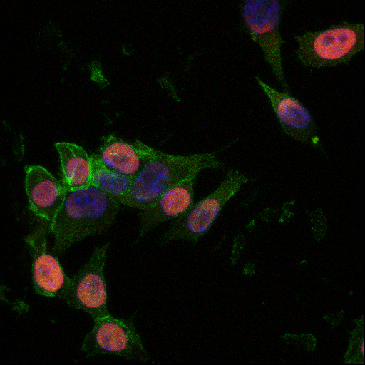 "We knew that Nanog was somehow involved in keeping stem cells pluripotent; now we know which mechanism it uses and we understand better how it works", explains Lucía Marucci, one of the authors of the work from the Cell Reprogramming and Regeneration laboratory at the CRG, led by researcher Pia Cosma. "Studying this process has allowed us to discover not only Nanog's key role in reprogramming, but also the dynamics of another protein, known as beta-catenin. We now know that beta-catenin, just like Nanog, continuously fluctuates in the cell and does not only appear when reprogramming is activated", adds Elisa Pedone, co-author of the work from the same laboratory. In order to understand and define parameters for the activity of both proteins, the researchers have developed a mathematical model that could explain this dynamic. The model could be useful for understanding the behaviour of these proteins in the cell both over time and in different situations. We are talking about a basic discovery on the functioning and dynamics of stem cell reprogramming. An ever-more studied process that holds great hope for the medicine of the future. The laboratory at the Centre for Genomic Regulation led by the ICREA research professor, Pia Cosma, is making a definitive contribution to this knowledge. Her group looks at basic mechanisms that orchestrate cell differentiation and reprogramming, right up to concrete reprogramming methods for repairing damage in certain tissues. The work has been made possible thanks to the support and funding of the Human Frontier Science Program and an ERC Starting Grant from the EU.